Definition - What does One-Legged Dolphin Pose mean? One-legged dolphin pose is a balancing posture that uses the arms and one leg at a time for support. This asana is entered from downward-facing dog pose by placing the forearms on the floor in front of the body, parallel to each other and with the palms facing down. The rib cage is then lifted and the pelvis tucks in. While one of the legs is lifted straight up in the air, the other foot remains on the floor. 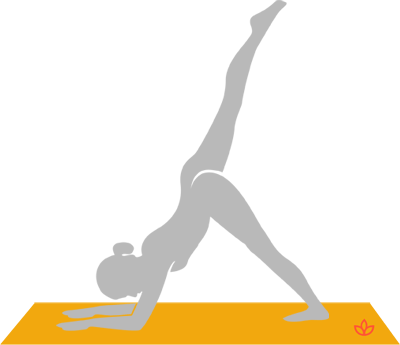 The pose may then be repeated with the opposite leg. One-legged dolphin pose may also be referred to by its Sanskrit name, eka pada makarasana. One-legged dolphin pose is a calming yet energizing asana which stretches a number of parts of the body such as the hamstrings and shoulders. Other physical benefits include strengthening of the arms and legs. Long-term benefits that have been linked to one-legged dolphin pose include improved digestion, back pain relief and lowered blood pressure. This posture can be carried out as part of a series of asanas including the related postures of dolphin pose and dolphin plank pose.